... I've got horses to round up. Do you know how hard it is to have a gender neutral pony party? My Little Pony is awfully pink and glittery, and involves a lot of hair brushing. I don't think there's a male pony in the bunch, either. Ah, well. I'm doing my best not to alienate the boys with these party favors. Felt lollipop covers. 24 down, how many more to go? Well, I'm really not sure, because, frankly, many of our friends and relatives need a gentle reminder of the definition of R.S.V.P. Ahem. I should resurface sometime soon, maybe not in time to post a color photo for this week, but sometime soon. You're doing an excellent job on those little horseys! I think the kids, and adults, will love them. What a clever idea! They are so, so cute! I agree with Felicia, everyone is going to love them. Those are too cute! --very gender neutral! What a good mom you are! Don't worry about your friends and family! I really don't think there are many people these days that know what RSVP means. Unless they are a crafty person and know how much time thought and effort is spent making the party perfect for each individual person (ie., food, place settings, favors, decorations) they just don't get it! 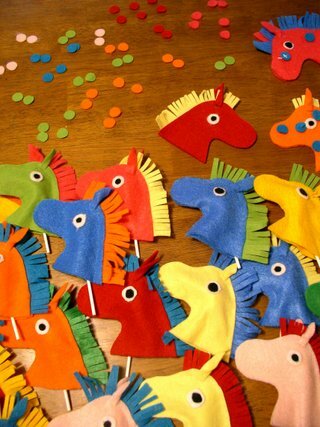 I do think love is in the details so keep spreading the love (and making ponies) I hope your party is wonderful! Those are wonderful! I love doing things like that for birthdays. She's one lucky little girl. YOu know what? My mom and I made those little candy cane covers shaped like horses many, many years ago! It's so cute to see them again! 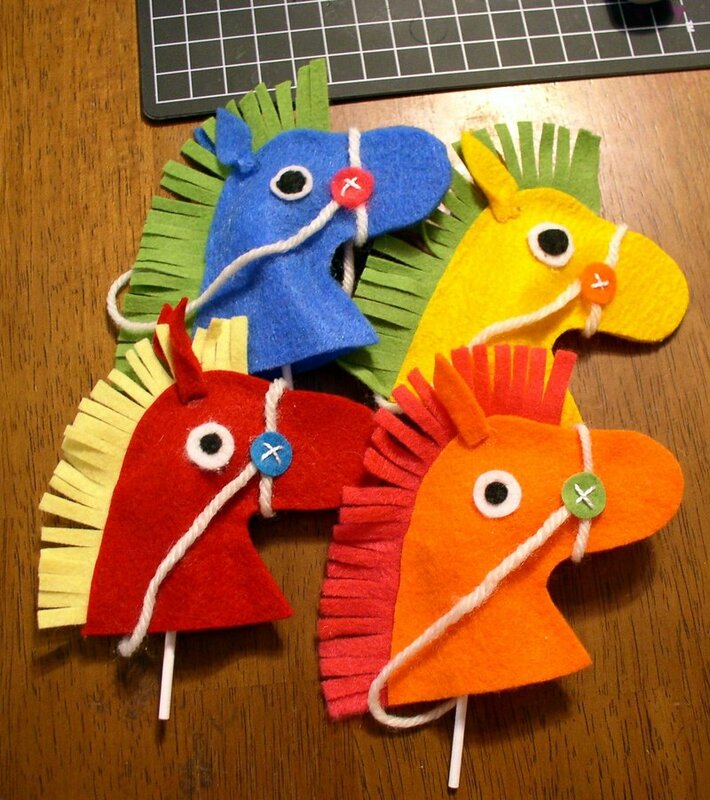 These ponies are so cute... great idea! Those are great. My favorite Christmas tree ornament as a little girl was a horse like those. I thought they were cute and they always had a candycane inside. WOW! What a great idea. There are so many of them and they are super cute! The pony thing is universal. I was lucky enough to grow up in Indiana and had a pony at Becca's age. Yesterday Ruth (age 8) and her freinds were playing "Pony" by riding sticks up and down the drive. The two in the front were yelling, "Eat my DUST!" and the one in the back was coughing.... those ponys kick up a powerful dust. Awesome favor for a horse-theme party (and you are correct that this kind of a horse theme party works well for both boys and girls). 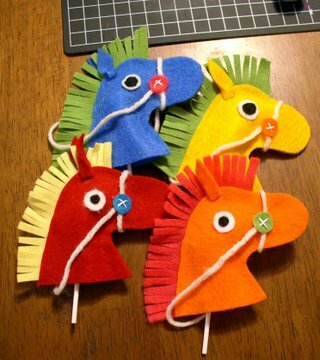 I'd love to put this adorable favor idea on our Web site of pony party ideas. Please write us back with permission.